Custom Magnetic Calendar or Coupon Card Personalized in Bulk on both sides. Promotional, Very Inexpensive. 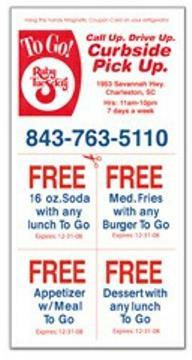 We supply bulk Magnetic Coupon Stick-Up Cards printed in Full Color on both sides! Budget Prices in USA and Canada for custom coupon magnets. We will send you a proof for your approval before production. Free artwork design. American clients pay no taxes. Unit Prices below include your full color custom imprint on both sides of the Coupon Magnet!